It's the day after our Spreading Holiday Love and Cheer Party. I'm wiped. 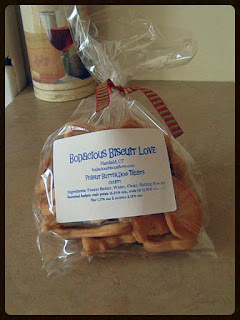 However, despite making changes to our Bodacious Holiday Biscuits over the past few years, we got quite a few orders. In addition, we've got some Bodacious Care Packages and Holiday Love and Cheer Packages we're sending out next week. And, we always give Holiday Biscuit Love to our friends who have furry kids. Since day one of Bodacious Biscuit Love, I've held onto the same system of taking orders. When I receive an order or request, I write it down on a PostIt Note and hang it on the kitchen cupboards above the counter where we roll and cut our biscuits. It works. We've never missed an order. We've never been late shipping an order unless it's been weather-related. Over the past few days, the PostIt Notes have multiplied. A lot. Last night, before signing off to grab some sleep, I added up the amount of Bodacious Holiday Biscuit bags we needed for orders. Then, I added what we'd need for care packages, pet parents in need, gifts, restocking our display, and to have at least 12 bags left over. When I had that number, I multiplied it by the number of biscuits we put in a bag. The total was a little over 2,000. Originally, my plan was to take today off from any type of kitchen duty. My body needed a break. However, I realized with that many biscuits to bake, that was no longer an option. I would have to start baking today. Early. A start time no later than 9:30 a.m. I baked until about 6 p.m. Lisa assisted periodically throughout the day and cleaned up once I was done. After getting a final count on what we had baked today, I knew I'd be baking biscuits all morning and afternoon tomorrow and quite possibly on Tuesday. Thankfully, Lisa took this week off for vacation. Her plans are to set up her woodshop downstairs, make a couple of DIY Outdoor Doggy Gates for me to paint and put final touches on, and run a few errands to avoid going to the stores the week before Christmas. Between all of that, she's offered to assist with baking. That's a huge help. I have 2 work deadlines this week as I'm wrapping up another 6-week project for a client. This is our busiest week out of the year. Baking Bodacious Holiday Biscuits. Wrapping up our holiday errands. Packaging. Boxing up orders and care packages. Shipping. Scheduling pickups. Then, I will officially be able to enjoy my favorite week out of the entire year...the week before Christmas.